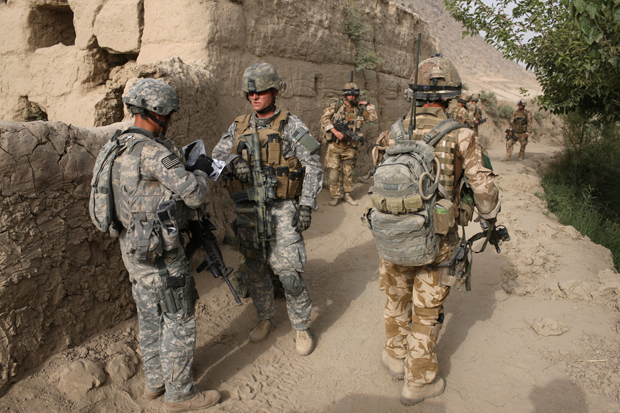 Paratroopers from the 3rd Battalion Parachute Regiment, soldiers from the U.S.-led Task Force Paladin and an unidentified U.S citizen from Dallas, Texas, center, working as a civilian contractor to advise the U.S.-led Task Force Paladin, take part in an operation to search three compounds and look for weapons in Salavat, Panjawi Province, Afghanistan. In World War II, contractors made up just 10 percent of the military workforce; by the Iraq war, that number had risen to 50 percent. And that number is climbing – not just in the U.S. but worldwide, as governments look to save money and keep casualty numbers down for their own militaries. But what does this trend toward private-run warfare mean for the future of international relations? One former contractor warns that armies-for-hire will soon be the norm, making it easier than ever to wage war. What an increased reliance on private armies could mean for modern warfare and global security. Sean McFate Senior fellow at the Atlantic Council and professor at Georgetown University's School of Foreign Service. Former paratrooper in the U.S. Army's 82nd Airborne Division, and former private military contractor in Africa.